We are Manufacturer and Supplier of Glass Shower Enclosure. 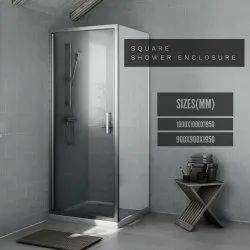 We offer a wide range of Glass Shower Enclosures that includes Shower Hinges, Shower Sliding Door System, Sliding System. To cater to the variegated demands of our clients, we are engaged in offering Shower Glass Enclosure. We are engaged in offering high quality Glass Shower Enclosers to our customers.